No one would dispute that the duty to provide for those that you have a legal and moral obligation to support is very important. With the movement and migration of people both within Europe and globally, there are more and more families and relations who live in different States. Therefore it is imperative that suitable and workable methods exist to create maintenance obligations and then secure the transfer of funds, particularly from abroad. 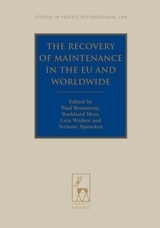 In the book the provisions in EU Maintenance Regulation no 4/2009 and the Hague Maintenance Convention of 2007 are analysed in order to discover what developments and therefore potential improvements have been made in relation to the recovery of maintenance from abroad. The book also includes an empirical study on the first year of operation of the Maintenance Regulation. Data collected has been analysed in order to supplement the critique of the instruments. The information and analysis is used to suggest suitable solutions for the future, which include amendments to the Regulation and recommendations for best practice. VII. Are the Separate Procedures Understood in Practice? Lara Walker is a Lecturer in Law at the University of Sussex.